We like to pretend they we're trendy from time to time, and so when on a walk through rapidly gentrifying Hackney we stumbled across an incredibly trendy place, we knew we had to review it. In fact, the Advisory is so trendy that A was the only man in the place wearing straight cut jeans and with a symmetrical haircut. It also just happens to be a place that's quite highly rated by people in the know, such as Timeout, which gave the place a rave review. We weren't that hungry and so both of us plumped for the Poutine, a dish from Quebec (ooh, trendy!) which is basically the poshest chips and gravy you've ever seen in your life. 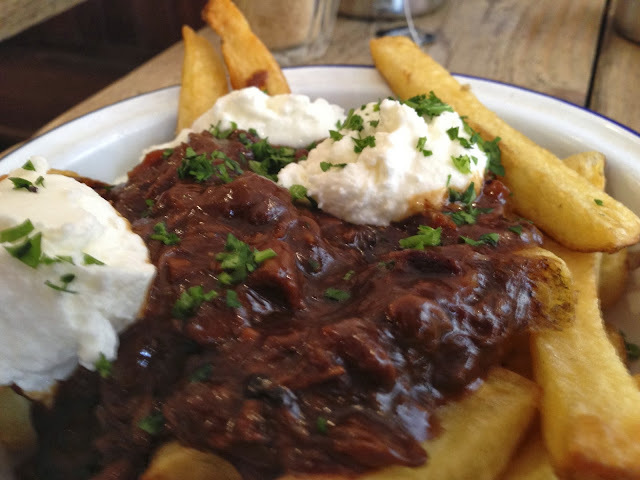 A plate of chips turned up smothered in what was basically a warm lamb stew and with some kind of curd cheese and parsley. It wasn't perhaps the most sophisticated thing we've ever eaten but it really hit the spot on a long walk and warmed us up on a cold and drab day, and was so delicious we contemplated ordering another round each too. While we didn't eat them, we also saw a number of frankly awesome burgers go by - see their profile pic on Twitter for an example. The sides looked pretty amazing too, with stacks of onion rings some six inches high going past the table. Again, while we can't vouch for them, the diners sitting around us looked pretty happy. 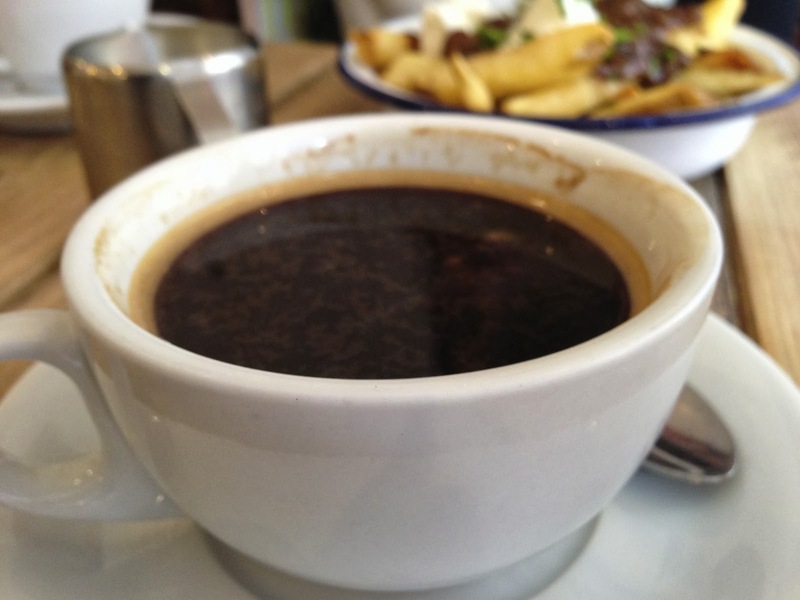 The coffee rocks as well and is not overly expensive. A didn't quiz the baristas on the finer points of the coffee (as he has been known to do in the past, pedant that he is) but it was pleasant, not too bitter and had pleasant nutty and chocolate notes without being one of those extremely dark roasts that is almost overpowering. For a couple of quid, it was a lot better value than some other coffees A has had out recently (such as at Workshop in Clerkenwell). While this place is out on a limb away from the tubes, seems like quite a nice little diner and is relatively inexpensive: our poutines were £5 each. Also, did we mention the place is a little bit trendy?